The Night of the Iguana tickets on sale now! 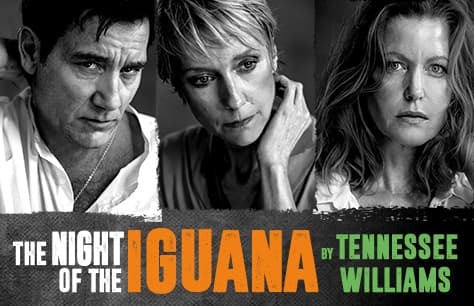 An all-star cast comes to the Noel Coward Theatre to bring Tennessee Williams' The Night of the Iguana to the West End once more. This limited 12-week run begins 6 July and The Night of the Iguana tickets are sure to be some of the summer's hottest tickets. Act fast and book your tickets for The Night of the Iguana now to guarantee your chance to see Clive Owen on the West End stage this summer. Set in 1940's Mexico where a group of travellers come together at the worse-for-wear Costa Verde Hotel. An ex-minister turned second rate tour guide, an underage girl, a recently widowed hotelier with predatory intentions, an ageing poet and his granddaughter, the painter all come together in this tropical tale. An astounding battle between body and soul, freedom and captivity, faith and art is heightened by an intense tropical storm and uncertainty about what is coming next. The West End production of The Night of the Iguana promises to be full of familiar faces. The star-studded cast features an array of stage, film and screen stars coming together to stage one of Tennessee Williams' great works at the Noel Coward Theatre. 18 years after performing in A Day in the Death of Joe Egg at the Ambassadors Theatre award-winning actor Clive Owen will return to London's West End to star in The Night of the Iguana as Rev. T. Laurence Shannon. Owen is perhaps most well-known for his film career including starring roles in Children of Men and Closer. He last appeared on the stage in 2015's Broadway production of Old Times. Lia Williams is set to star opposite Owen as Hannah Jelkes. Williams is no stranger to the stage or screen. Her performance in Skylight earned her both Tony and Olivier Award nominations. Most recently she has appeared on stage in the 2016 production of Mary Stuart as and starred in the 4-part miniseries Kiri. She will be joined by Anna Gunn playing widow Maxine Faulk. Gunn is best known for playing Skyler White on the AMC hit television series Breaking Bad, a role which earned her two Emmy Awards. The cast will be rounded out by Olivier Award winner Julian Glover as Nonno. Glover is most recently known for his portrayal of Grand Maester Pycelle in HBO's Game of Thrones. Further casting for The Night of the Iguana will be announced in due course. Tennessee Williams is widely considered on of the foremost playwrights of 20th century American drama. A prolific author, Williams penned such classics as The Glass Menagerie, ﻿A Streetcar Named Desire﻿﻿ and ﻿Cat on a Hot Tin Roof﻿. Considered by some the last of his great works, ﻿The Night of the Iguana﻿ was awarded the New York Drama Critics' Circle Award for Best New Play in 1962. Williams also received 2 Pulitzer Prizes and a Tony award among many other awards, honours and recognitions throughout his prolific career, and even after his passing. The Night of the Iguana tickets are sure to be some of the hottest of the season. Don't miss your chance to catch this sweltering drama with its red-hot cast. Tickets for The Night of the Iguana are limited so book early to guarantee your seats.